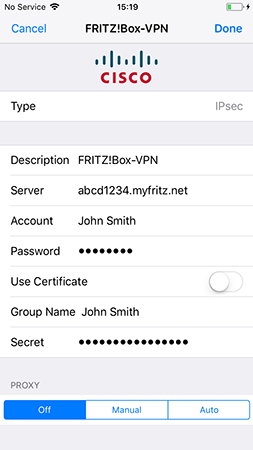 VPN (Virtual Private Network) allows you to establish a secure connection over the internet from your iPhone, iPad, or iPod touch to your FRITZ!Box and then access all of the devices and services in the home network of your FRITZ!Box. Whenever a VPN connection is active, all web requests from the iOS device are also routed over the FRITZ!Box. This enables you to access all internet services, such as email and online banking, with your iOS device even in public wireless hotspots, while protecting you against data interception and manipulation. 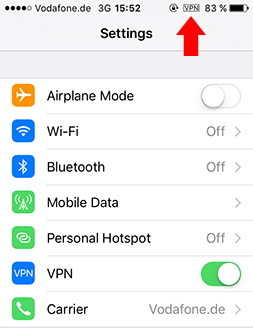 Note:In this guide we show you how to configure a VPN connection to the FRITZ!Box using an iPhone 5 with iOS 9.2. 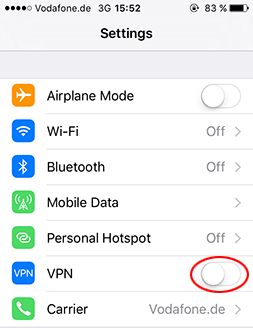 If you have further questions about VPN connections in iOS, contact Apple directly. iOS 3.1 or later is installed on the iPhone, iPod touch or iPad. The FRITZ!Box must obtain a public IPv4 address from the internet service provider. Note:If you already use a different dynamic DNS service, you can also use this service instead of MyFRITZ!. Both ends of a VPN connection must have IP addresses in different IP networks. VPN communication cannot occur if your iOS device is connected to a router (for example another FRITZ!Box) that uses the same IP network as your FRITZ!Box. Note:All FRITZ!Boxes use the IP network 192.168.178.0 in the factory settings. Click "FRITZ!Box Users" in the "System" menu. Click the "Add User" button. Enter a name and password for the user in the corresponding fields. Now the FRITZ!Box sets up the VPN rights for this FRITZ!Box user. A window displaying the VPN settings for the FRITZ!Box user then opens automatically. Note:You can open this window any time by clicking "Show VPN Settings" in the settings for the FRITZ!Box user. Note:You can access the VPN settings if you select "System > FRITZ!Box Users" in the user interface, call up the settings for the user, and click "Show VPN Settings". Tap the "Settings" symbol on the home screen of the iPhone, iPad or iPod touch.